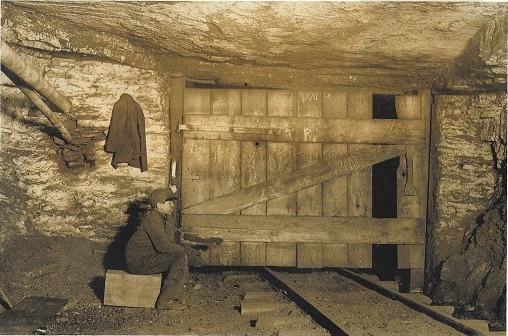 Many pre-adolescent boys were required to garner employment in underground mines to supplement the family coffers. Trapper boys were usually the youngest of the young. Their job was to open and close the heavy wooden doors which blocked the gangways and tunnels in the mine. When closed, the doors directed airflow, allowing fresh air to be forced into the tunnels where men were working. The flow of air also pushed out dangerous gases, preventing explosions. The trapper would sit on a bench in his pitch black room, listening for the rumble of mine cars. He would open the door to let them through, then quickly push it shut again. It was a lonely, boring job. William Powell was a trapper boy. He was born in Pittsburgh, Pennsylvania in February,1870. He was the only child born to James Armstrong and Priscilla Beeman Armstrong. William’s father apparently died when William was very young. He, along with his mother, took the name of Powell when she married Edmund Powell, a coal miner living in North Huntingdon, PA. By 1880, the small family had moved to Lonaconing, where Mr. Powell continued to work in the trade he knew best. Like so many boys at that time, William finished his schooling after the third grade. He began his “mining career” in the Miller Mine, located near Midland, close to the present intersection of Route 36 and Ocean Hill Road. As a trapper boy, he would sit all alone in the dark bowels of the earth. The only sounds he heard were the scurrying and scratching of the rats nearby, or the creaks and groans when the roof was “working.” Often times, the trapper was the only one to hear these groans, as the other miners were busy pounding, drilling, and blasting. They depended on boys like William to warn them when these telltale sounds were heard. More often than not, William was just plain bored. Visibility was nearly non-existent, as the oil wick lamps of that era gave off only enough light to see what was directly in front of one’s face. He was isolated, and the job was sometimes scary. It was imperative, however, that William stay awake at all times; if not, a trip of cars could come crashing through the doors and run over him. Trapper boys stayed alert by doing what they could feel, such as whittling. William probably kept his mother well-supplied with wooden spoons; with no younger siblings, he had no reason to carve a doll or a toy soldier. Sometimes trapper boys would entertain themselves by catching rats, and seeing how long it took them to escape. On November 29, 1882, William heard a commotion on the other side of the big wooden door, and went to investigate. Some mine cars had jumped the tracks; he assisted the driver with getting the cars back on the track, and then decided to ride the cars along the plane through the door. A rope had slackened during the derailment, and when the trip began to move, the rope tightened. William was jerked off the car and thrown under the wheels. His mining career of not more than two years was over; William was buried in Frostburg Memorial Park, another child miner gone too soon. Edmund and Priscilla’s mourning for their son was lightened just a bit when their daughter Caroline was born a few weeks later. She was joined by Sempronius in 1884, Priscilla in 1887 and Desdemona in 1891. Had William survived, the little wood carver would have stayed busy in his Stygian cave, carving all sorts of toys for the siblings with whom he would never play.